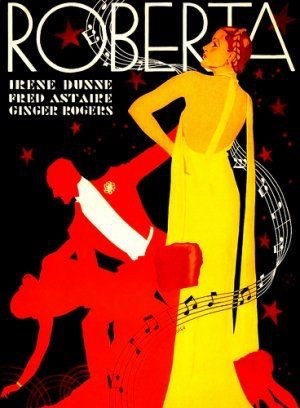 A stunning poster for ROBERTA, with those yellow,red and blacks. No attempt to show Fred and Ginger’s faces, but it doesn’t matter. The figure representing Irene Dunne suggests the regal character she portrays in the film. And the lines of music weaving round them. I don’t know who designed it but all credit to them. Love it. Would have enjoyed Madame Roberta (aka Aunt Minnie) as a facial silhouette in the background, but you can’t have everything. Not even an All-American halfback or three-quarters back! Yes, the film is after all named after Aunt Minnie!